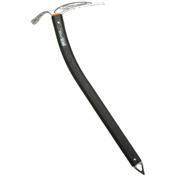 The Petzl Summit Mountaineering Axe uses a rubber-coated aluminum shaft to improve your grip and insulate your hands on the way to the top. A hot-forged steel head ensures plenty of durability to handles the abuse of life in the mountains, so you don't need to re-sharpen it every time you head out for some peak bagging. Petzl also curved the upper shaft for improved clearance on steep terrain, so you can take on technical routes instead of only walkups.